Eliza Marie Brook Vaughn, daughter of Geneva Stinnett and Gary Vaughn, has her footprint taken using CertaScan's First Footprint. UAMS is the first Arkansas hospital to adopt the infant footprint and photograph system. Nov. 16, 2016 | Nov. 16, 2016 | The University of Arkansas for Medical Sciences (UAMS) is the first hospital in Arkansas to implement a program that will give new parents a keepsake of their child’s birth and an assurance of the newborn’s safety. 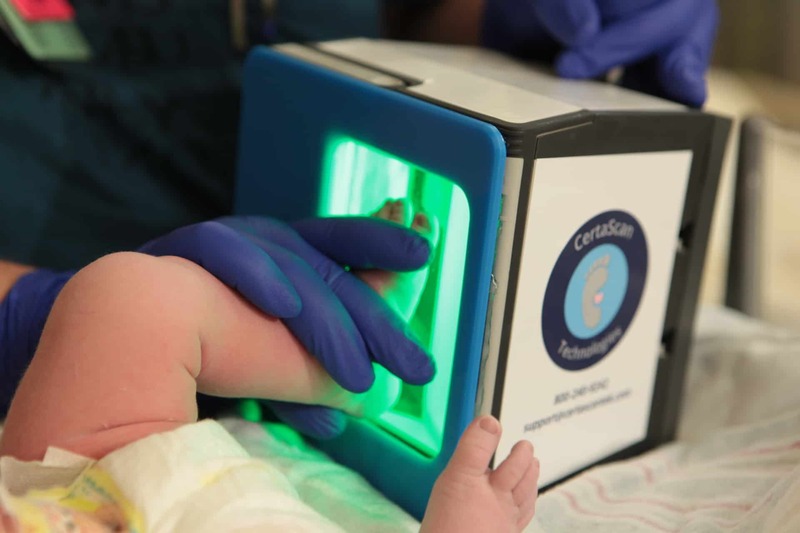 Through a partnership with CertaScan Technologies’ First Footprint, parents will have the option to have their child’s footprint scanned and their photograph made immediately after birth. The mother’s index fingers will also be scanned and linked to her newborn. In the event of an abduction, missing child situation or other emergency, this allows for quicker, more efficient identification. The service is provided at no cost to the family. An electronic scan of the footprint is the quicker, preferred method over an ink print on paper, said Smith, because of the scan’s clear, identifiable image as opposed to an ink print that is prone to smudges and more time consuming for hospital staff. The footprint and photo will be uploaded to firstfootprint.com and stored for one year. The families will be provided a certificate with the baby’s name, footprint, birth date and time, weight, and height, creating a personalized keepsake. Families will also have access to the certificate online and have the option to customize, download and print multiple copies of the certificate. “This is another way to show how much UAMS cares about each newborn while providing another level of safety,” said Smith.